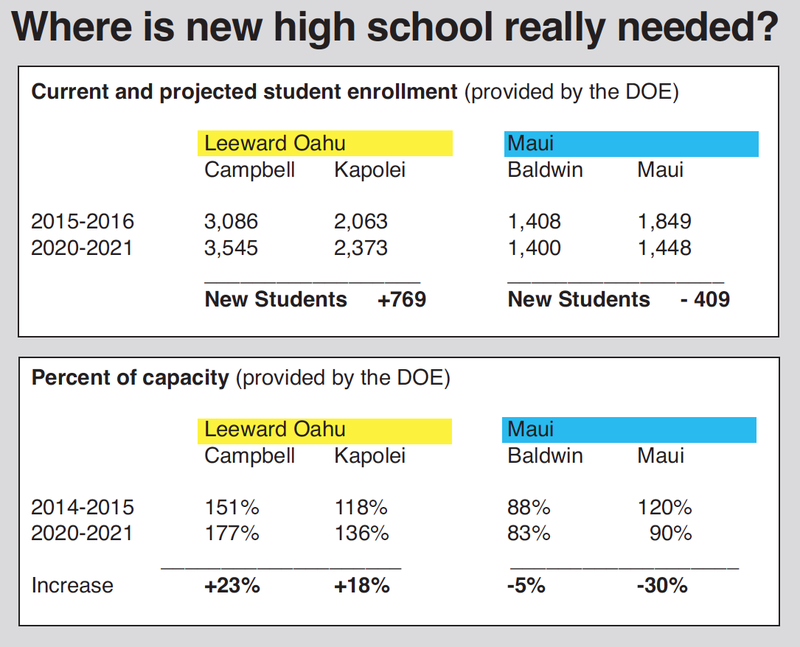 The DOE’s own enrollment numbers and projections are clear, West Oahu is in urgent need of a new high school. McDermott said, “the Governor’s new proposed building for Campbell is a half measure, and the day it’s completed Campbell and Kapolei will still be grossly over-crowded. McDermott said the DOE has been co-opted to keep their mouths shut and go along with the powerful politicians who want to deliver pork to their islands. The numbers say it’s not needed, not to mention the huge operational costs of another high school being layered onto an already thinly stretched DOE budget; once built the implementation of the student weighting format will cause Maui and Baldwin high schools to have anemic funding level due to the transfer of students to Kihei, meaning loss of teachers, programs and extracurricular activities. McDermott has called on Governor Ige to restore transparency to his administrative departments and especially the DOE, so that legislators can be fully informed where facilities are actually needed before committing such large amounts in CIP budgeting.